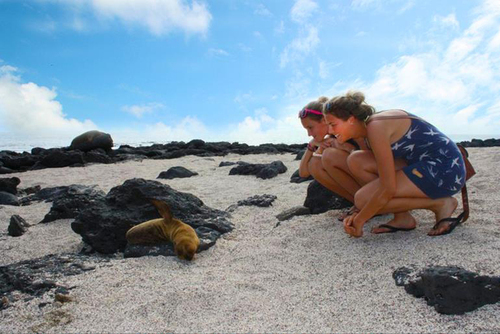 Get to know the ¨Real¨ Galapagos by spending some quality time at three unique islands. Also, learn from local scientists about the current social and environmental issues affecting the islands. Island Hop, Galapagos Volunteer and Travel! All in One Experience! Conservation work on Santa Rosa Reserve, swimming with sea lions on San Cristobal Island, meeting the giant Tortoises on Las Tintoreras, and adventuring everywhere - this is a trip for the true explorer. Everybody travels these days but not everybody will have an experience like this one. In fact, we have very limited spaces and they fill up fast. This is one adventure not to be missed. This is the authentic Galapagos Experience, something so real that most people will never see anything remotely like it in their lifetime. This is your chance to do something unique and to make a difference at the same time. You are going to get your hands dirty, but we guarantee it will be worth it. You will be contributing to the conservation of one of the most wondrous and unique places on earth; as well as meeting new people and having the time of your life. If you think you this type of trip is for you. Fill in your application today before it is too late. Observe giant tortoises in their natural state at Primicias Range. Visit the Charles Darwin Station. Enjoy the pristine white sandy beaches of Tortuga Bay. Tour Academy Bay by boat, including snorkeling at Loboria Island, & hike to Las Grietas for a swim in the crystal-clear water beneath lava rock cliffs. Free time for independent exploration and activities. Speedboat to San Cristobal Island. Volunteer project for five days with the San Cristobal Station. Relax at Playa Mann beach where you can soak up sun near the sea lions or rent kayaks to explore along the shoreline. Boat trip to Las Tintorera Islet to snorkel & hike, observing penguins, iguanas, reef sharks, sea lions and birds. Hike to Volcano craters of Sierra Negra & Volcan Chico to see the lava formations and unique landscape. Learn from local scientists about the current social and environmental issues affecting the islands! There are many environmental and social issues affecting these world-famous Islands. Traditional cruise companies and tours are growing in demand, affecting not only local ecosystems but also social interactions between the animals. The Galapagos are populated islands that must generate local income in order to keep its inhabitants away from depleting the natural resources. Cruise companies do not use local providers for their packages (not to mention the fuel consumption and pollution issues they create). 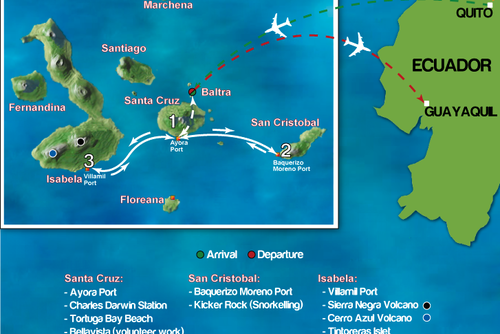 Therefore the Galapagos' residents do not receive the benefits from cruise-based tourism. On the contrary, our travel volunteer program leave most of its proceeds with the local community, which helps the locals stay away from depleting the islands natural resources and instead take care of their natural environment! Programs are available year round starting every Monday of the month. 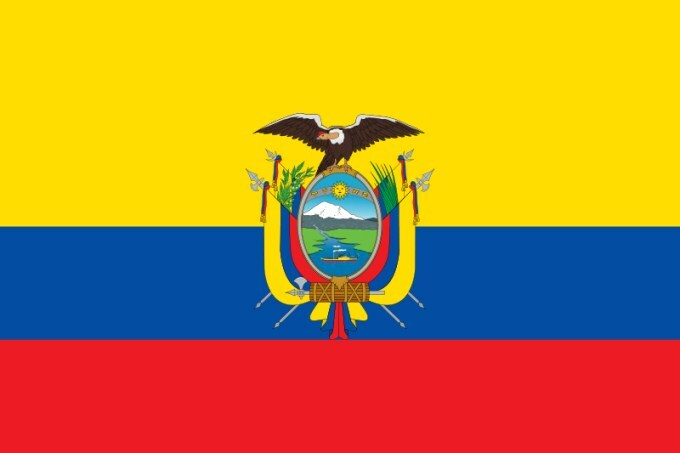 - Full Accommodation in Quito. 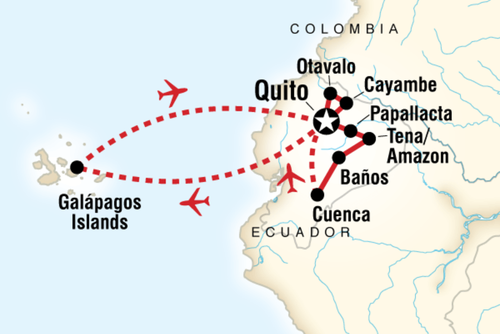 - Logistic and scientific Orientation in Quito. 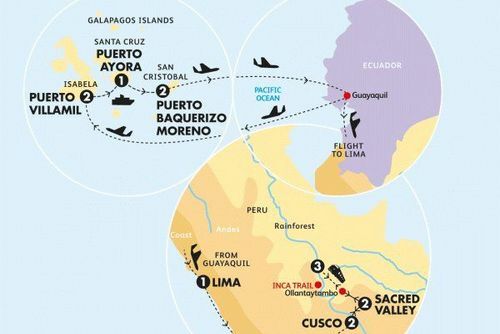 - Full Accommodation in The Galapagos Islands. - Transportation between islands in Galapagos. 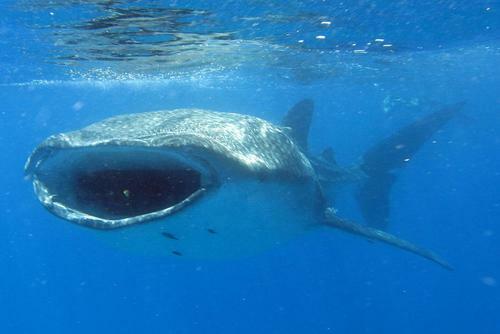 - Excursions and activities in Galapagos. - Some meals in Galapagos (ask for description). - 24-hour emergency contact number and support. - Airport Transfers (can be arranged at extra cost). - Galapagos National Park Entrance Fee ($115).